Together with its neighbour, Magaluf, the island resort of Palma Nova, on the southwest coast of Mallorca, makes up the most popular holiday area on the island, situated a few miles west of the capital, Palma, and the Palma Mallorca Airport (Airport Son Sant Joan). Most visitors to Palma Nova come on package tours from the UK, intent on enjoying an entertaining, fun-in-the-sun vacation in a 'home-from-home' setting. Few are disappointed because the purpose-built resort offers all they need and more, from beautiful beaches to a wild nightlife. The three sandy beaches of the holiday strip, Es Carregador, Playa de Palma Nova and Son Maties, are backed by a long promenade and have European Blue Flag status. Palma Nova is divided from Europe's famed party capital, Magaluf, by a rocky headland, but the resorts are basically merged into one conglomerate of hotels and apartments offering a range of accommodation from budget self-catering to luxury suites. Palma Nova is known as the quieter section of this hedonistic seaside development, and therefore more suited to families. Many Palma Nova hotels offer discounted rates during off-peak but a fair amount of the bars and nightclubs in the resort are closed during winter. Holidaymakers who prefer not to stray too far from their accommodation and the beach will be able to find all they need in the commercial centre of Palma Nova, which is liberally sprinkled with convenience stores, souvenir shops, gift shops, camera and electrical goods stores, a chemist and clothing outlets. For variety it is easy to take a stroll across to neighbouring Magaluf, which has even more tourist-oriented retail outlets. Serious shoppers can catch a bus or taxi into Palma, Mallorca's capital, which is famed for its excellent shopping, or visit one of the lively markets in the nearby towns and villages. For anything from gifts and souvenirs to delicious cheeses, olive oil and lively bargaining banter there is a weekly market held in nearby Andratx every Wednesday. Palma Nova has some of the best restaurants on Mallorca. Great eateries in this Spanish resort town include Maritimo, Natalies, Real Dion, Modigliani and the unimaginatively named Palmanova. The long promenade that stretches along the three beaches of Palma Nova is lined with dozens of good restaurants offering British, Chinese, French, Italian and Mexican cuisine. The resort also bristles with fast food outlets of all descriptions. Several Spanish bars serve up tapas snacks during the day, and of course there are plenty of seafood eateries to choose from in Palma Nova. Some of Palma Nova's bars have discos, live acts or TV (football and UK soaps) for holidaymakers to enjoy. Palma Nova and Magaluf have virtually merged, making the choice and range of nightclubs and bars even greater. In Palma Nova itself, tourists wanting a pub-type bar should go to Willows, while those after music bars and clubs can choose from Banana Joes, Papis and Ruby Tuesdays. Many of these bars have Facebook pages allowing Patrons to access all their clubbing holiday photos from Palma Nova. 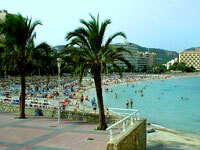 Magaluf is the more party-orientated resort and has a more energetic nightlife. Palma Nova offers numerous pursuits to entertain young and old, making it an ideal family holiday resort. All manner of water sports and boat trips are available on the clean, safe beaches and there are plenty of sports facilities, particularly golf courses, in the vicinity. The resort's most popular attraction is an intriguing mini-golf course, called 'Golf Fantasia', with 50 holes in a tropical setting. There is also a giant waterpark adjacent to Magaluf, a Wild West theme park, a go-kart track, and a marine park featuring dolphins and sea lions a short distance away. Most holidaymakers opt to hire a car or moped to make excursions around the island taking in all the things to do and see on Mallorca. The Palma Nova resort is also connected by a frequent, cheap bus service to the historic island capital of Palma. Palma Nova, although not as busy as Magaluf, is a close second. Beaches and streets can be crowded and congested in peak season, and this is not the place to seek out peace and quiet. Clubs often have touts or reps encouraging patrons to choose their establishment; these PRs are sometimes seen as a nuisance.